There is a long established pipeline of footballing talent that runs from the Swiss Super League to the German Bundesliga. From the likes of Ciriaco Sforza and Alexander Frei through to Xherdhan Shaqiri, Granit Xhaka, Yann Sommer and Roman Burki. The similarities in culture and language between the two nations and the popularity of the Bundesliga in Switzerland make the transition easy for Swiss players making the step up. The latest player to utilise this well worn path is the young central defender Manual Akanji who moved from Basel to Borussia Dortmund for a reported £19.5 million. At just 22 years of age Akanji has still to reach his potential and he has the kind of ceiling in terms of talent that should go on to make the transfer fee become a bargain, especially in the climate of today’s transfer window. Indeed Akanji should prove to be yet another astute signing from the recruitment team in Dortmund. Having already recovered from a serious cruciate injury and having lost none of his athleticism Akanji is mature for his age and plays in a composed manner with the ability to play the ball out of defence or to carry the ball forward to provoke the opposition to press and create space in their defensive structure. There will be a period in which Akanji gets used to his new club and the pace of the Bundesliga, after this I would expect that he will start to get first team minutes partnering either Sokratis or Omer Toprak at the centre of the Dortmund defence. What kind of player are Dortmund getting though? Whilst Akanji is likely to feature at centre back for Dortmund and that profiles as his strongest position he has also spent time at right back. 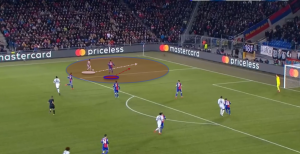 This positional flexibility means that Akanji is excellent at defending when isolated against an attacker in the wide area. With the pace of the game in Germany and the tendency of sides to attack via rapid transitions there are times that as central defenders you will have to defend in space in difficult situations. Here Akanji is isolated in his sides left back position against a forward attacking at pace. In this particular example if Akanji is beaten by the attacker then he has a clear path in towards the Basel goal. Akanji profiles as a defender with pace and power however and he is able to not only keep pace with attackers in these areas but also to win the ball back. He is intelligent in his positioning and use of angles to prevent the attacking player from looking to cut back inside with the ball. This time Akanji is pulled out in to the right back area, a zone that he is more comfortable than the example above. This time with less space for the attacking player to drive in to the onus on Akanji is to prevent the attacking player from being able to either put a quality cross in to the penalty area or to cut inside to drive towards goal. He is intelligent enough to not dive in for the tackle and instead blocks off the route in to the box, forcing the man in possession to either move backwards or play the ball back in to a supporting position. With the evolution of football to the modern game the role of central defenders has changed immensely. Gone are the days when defenders were there purely to stop the other team from playing, now there are matches in which the entire pitch will be condensed with the central defenders being the only players that enjoy space and time on the ball. This leads to central defenders having to develop their ability to not only see space on the field but to play the ball in to these spaces. Manuel Akanji is a good, if not great, passer of the ball with the capacity to play diagonally across the field in to space. With Dortmund using wide forwards as well as fullbacks they tend to favour overloading the wide areas and this passing range from Akanji can facilitate this. In possession of the ball on the left hand side of the field in this example Akanji does not have a lot of options ahead of him for the simple pass, he is also being closed down by the forward who is covering the pass back to the second central defender with his cover shadow. Akanji however does not panic in these situations and instead he identifies the space on the far side of the field where an attacking wide player has pulled off the shoulder of the fullback. He has the range of passing to allow him to play the ball over the top of the defensive line to allow his teammate to run on and attack the penalty area with ease. Again in this example we see Akanji in possession of the ball on the left hand side of the field. Note how advanced he is, with teams that prefer to sit in a deeper block Akanji is comfortable moving in to more advanced positions both to provoke the defensive team in to breaking their structure to close down the ball or to play the pass through or around the defensive block to allow his team to penetrate in to the penalty area. Here once again there are limited short or ‘easy’ passing options open to Akanji with his more advanced teammates covered by opposition players. This time however there is limited pressure being applied to the ball by the opposition. Once again we see Akanji able to identify space diagonally and he has the technique and passing range to execute the cross field pass. Playing for a team like Basel in Switzerland, and indeed for a side like Borussia Dortmund in the German Bundesliga you are going to come up against more and more sides that sit in a passive block in order to negate your attacking threat. This is why it is important in the modern game to have players who are either able to dribble through defensive lines or pass the ball through to teammates in more advanced areas. Manuel Akanji is capable of breaking the lines with forward passes, whilst this by no means is something that he will look to do in every possession he is capable of doing so in situations that call for it. Here we have Akanji in possession of the ball having advanced down the right hand side of the field. With the opposition remaining relatively passive we see the defender make a vertical pass in to the feet of the striker on the edge of the penalty area. This pass alone effectively negates six of the opposition defensive players and allows his side to play from an advanced position. On the face of it the move to Borussia Dortmund looks like a sensible career move from Akanji, he had been linked relatively heavily to a move to Liverpool but in moving to Dortmund he has given himself the opportunity to complete his development at a club well known for trusting in younger players and in a culture that will at least seem familiar. In order to reach his potential Akanji will have to impress new Dortmund coach Peter Stoger enough to be given first team minutes over the second half of this season. If he does continue to develop however then Dortmund may well have found an elite defender for a relative bargain.